A group of student dancers draw their inspiration from an unlikely place: a turn-of-the century American industrialist. The mantra, first said by Henry Ford, has been repeated by the members of GW Raas throughout the past year in preparation for their competitions. The team’s co-captain Parth Chauhan uses the phrase to describe the team’s achievements this year – a year he says could be the most successful in its 10-year history on campus. Girish Tewani, far left, Bhavin Patel, left, Eishita Nariani, center, Nikhil Gupta, right, and Parth Chauhan, far right, rehearse. “I think the key to our success this year is good, old-fashioned hard work. Every single person on this team has put in a tremendous amount of time and energy in order to make this team successful this year. We are all constantly thinking about how we can be bigger and better,” Chauhan said. The dance team has already stacked up a list of accolades and is hoping to add another prestigious trophy to their case. This weekend the team will go to the national collegiate championship, the Raas All-Stars, in Dallas. 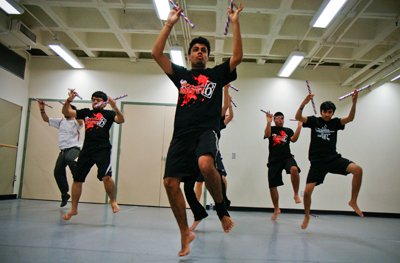 Bhavin Patel leads a pack of GW Raas dancers into a mid-air leap. The team spends about 30 hours a week in rehearsal and countless hours consumed by the competition, all in preparation for the six minutes the team will perform on stage. Both captains explained that the span of the journey they have sustained so far depends on more than the 16 people who they are travelling with. The team will perform a dance formed around the theme of the vending machine, something they describe as combining images of commercialism with the more traditional style of dance, typical of Raas. The group built a vending machine set to match their theme. Throughout their performance, they use drums, embellished with dollar signs, to vend a specific type of dance style. On another set, a dancer is given dandiyas, a type of stick traditionally used in the performance, in exchange for a coin. The intersection of modernity and tradition, accented by vibrant, colorful costumes, pits the traditional Indian folk dance against contrasting material-centered values. The executive board, made up of GW Raas alumni, helps chose the theme, choreography and conduct administrative issues. The group acts out a traditional folk dance originating from the Gujarat region of west India, and often uses colorful stage sets and props. The organizational complexity of transporting the team around the country to the various competitions requires the team to have their own pair of managers and a financial assistant. The Multicultural Student Services Center and the Student Association both help fund travel, and the rest is subsidized through fundraising and personal expense. Not only are all team members required to attend four-hour rehearsals every day, but individuals are also assigned other duties to ensure the operation of taking the team to Dallas runs smoothly. 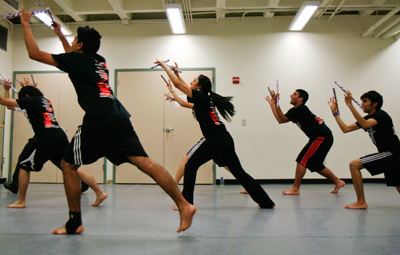 “Raas has given me the opportunity to work with an amazing cast of individuals and teams around the U.S. I have learned the importance of teamwork and dedication, as well as hard work and perseverance. GW Raas has helped me grow as a person,” Chauhan said.